Jacques started doing some SWL in 1938. In those days all home radios had shortwave bands and it was his initiation to the world of shortwave. Since 1950 he had never been without at least one radio that can pick up shortwave broadcasts and utility transmissions. Over the years, he owned or operated various types of shortwave receiving equipment. He was involved in building, setting up and operating the first commercially owned Weather Satellite APT (Automatic Picture Transmission) receiving station in Canada and a similar one in the Middle East. He was also involved in commercial radio-facsimile and radio-teletype operations. Over the years, he did research on antennas and in the "black art" of radio propagation forecasting. Each month he used to prepare the propagation forecasts page for the British magazine ShortWave Magazine, and for the web pages of Radio Amateur of Canada and the Ontario DX Association. For many years, he wrote a monthly column on propagation topics in Monitoring Times. Many of his articles on radio propagation and other radio-related subjects have also been published in handbooks and magazines worldwide. During the mid-90s the Russian service of Radio Canada International was also using his services to prepare the propagation forecasts that were supplied to the Russian listeners attempting to listen to worldwide broadcasts. Jacques had a commercial General Radio Telephone Licence and a Ham Basic and Advanced Certificate of Proficiency in Radio. 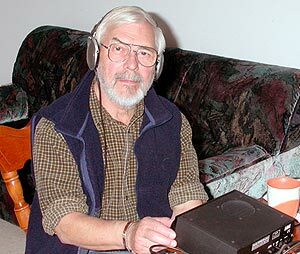 He was one of the main instigators of the SWL DXpeditions in Miscou Island NB, where the noise conditions are just right to easily hear European LW and MW broadcasters and also intercept some European and South Atlantic NDBs at all hours of the day. Jacques passed away on February 7th, 2013.